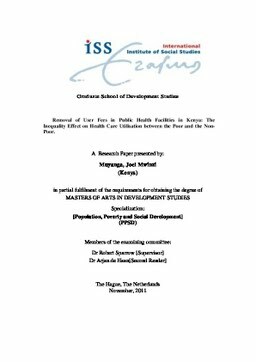 Erasmus University Thesis Repository: Removal of User Fees in Public Health Facilities in Kenya: the Inequality Effect on Health Care Utilisation between the Poor and the Non-Poor. Removal of User Fees in Public Health Facilities in Kenya: the Inequality Effect on Health Care Utilisation between the Poor and the Non-Poor. This study investigated the effect of the reducing user fees in public health care facilities on utilization in Kenya between 1998 and 2009. User fees were introduced in Kenya in 1989 and substantially waived for children below five years and special cases for adult in 2004 in all public facilities. Utilization of public facilities fell after the introduction, while the use of private went up in the period after introduction. Removing the user fees was found to increase the user of public facilities for both the poor and the non-poor, but the poor in urban areas were not equally likely use public facilities as their counterparts in rural areas. The poor in the urban though less vulnerable than had been during the user fees period, they were less likely seek health care attention after ill-health was reported compare to the poor in the rural areas. The analysis of the urban versus rural may fail to highlight this problem since the non-poor compensate for the poor not seeking health care services.